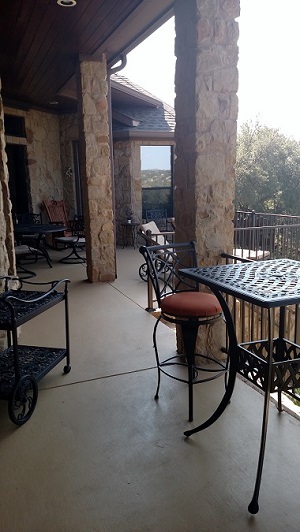 These Austin-area homeowners may not have realized, when they ordered an outdoor kitchen, that they would also be getting a side order of fantastic views! Sometimes one thing leads to another … Archadeck of Austin could see right away that their old, bulky cedar railings were blocking much of the view of the valley and the Colorado River below. This home’s covered patio was ready for an outdoor living makeover. And the homeowners were ready to add an outdoor kitchen on their existing patio. Luckily, when the house was built it had been pre-plumbed with a place for running water and a drain. The builders had also installed an electrical junction box for a potential outdoor kitchen. Wow! We don’t come across advance planning like that every day. As we designed the outdoor kitchen, it became clear that the patio wouldn’t offer quite enough room for the homeowners to move around the space comfortably. Once the new appliances were built in with countertop and surrounding stonework, the family and guests would need more room for patio furniture and space to move about. Archadeck of Austin designed a patio extension that follows the lines and curves of the home. The larger patio now provides the room these homeowners need to fully enjoy their outdoor living space. Part of the extension is sheltered by the original roof, and part of it receives full sunlight. Now the family will have a choice when it comes to enjoying the sun’s warming rays on cooler days or protecting themselves from too much sun in the heat of summer. We were careful to use materials for the extension that blend perfectly with the original patio and the home’s stone exterior. The patio’s concrete floor was dyed so the original floor and extension are the same color. This patio extension does not look like an add-on; it looks original to the home in all aspects! 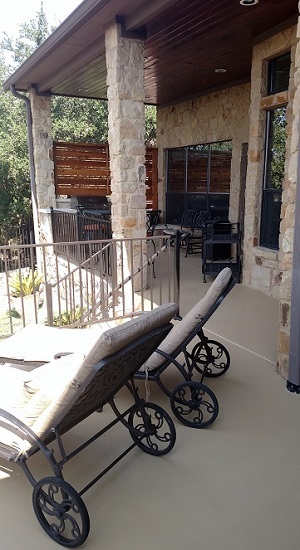 Another great feature of this patio makeover is its new railing system. We used Fortress iron railings in the hammered bronze color. 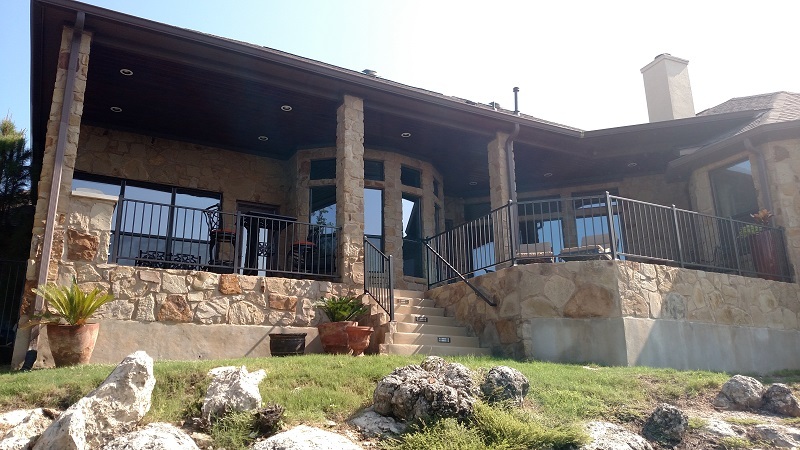 These iron railings are sturdy and much thinner than the home’s original cedar railings, and they don’t obstruct the beautiful views of the valley and the river below. It’s almost as though you can see right through them. We like this particular style of railing because of its hammered look with dimples and ribbons in the bronze color. It adds a vintage-inspired appeal and at the same time keeps a low profile. What’s more, it’s forgiving because it already looks “hammered.” You can’t hurt it! Also benefiting from a makeover were the original wooden steps that led from the patio down into the yard. They were no longer safe, so we did more than just change the railings. We redesigned the steps entirely, replacing them with masonry steps and installing hardscape lighting on the risers for additional safety. Back to that outdoor kitchen the homeowners first requested, the catalyst for the entire project. The kitchen area spans one end of the patio with a gas grill, a door-and-drawer combo set, a sink and a beautiful custom privacy wall. 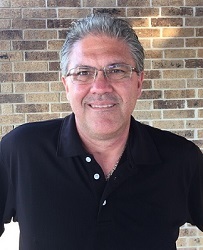 The grill master will enjoy preparing special meals for family and friends without the curious gaze of neighbors. 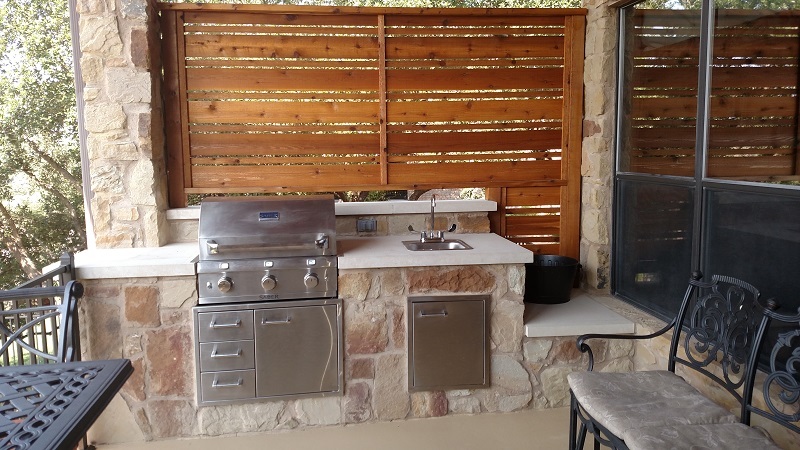 If you would like to learn more about creating an outdoor kitchen at your home — and the patio to show it off, contact Archadeck of Austin today at (512) 259-8282 or via email at [email protected] to schedule a free design consultation.